Former home of John Ruskin. 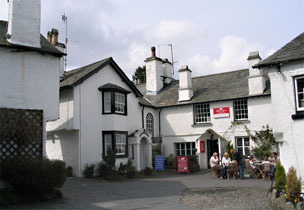 Brantwood is the most beautifully situated house in the Lake District. A memorial to John Ruskin and a celebration of the area's heritage. 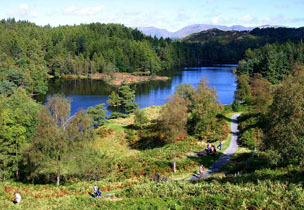 Grizedale Forest Park offers a fantastic day out for the whole family. Go Ape is an award-winning high wire forest adventure course of rope bridges, Tarzan Swings and zip slides. Farmhouse where Beatrix Potter wrote many of her children's stories. Popular landscaped beauty spot famously owned by Beatrix Potter at one time. For garden lovers, the Lake District abounds with beautiful examples. For its wonderful topiary, see the garden at Levens Hall. Be sure to visit Holehird, near Troutbeck Bridge, the home of the Lakeland Horticultural Society. Satterthwaite derives its name from the old Norse words ‘saetr’ and ‘thveit’ meaning ‘the clearing for the summer pastures’. It is a village of about 50 houses, the Church of All Saints and the Eagle’s Head pub, our local freehouse offering real ales and fine food. For more information about the village including its history and forthcoming events, visit the Satterthwaite Village website. It is set in a wide valley amid the Grizedale Forest Park, the Forestry Commission’s flagship leisure and amenity forest in the heart of the Lakes. There are eight thousand acres of mixed woodlands, criss-crossed by footpaths, bridle paths, mountain bike trails, sculpture trails and forest tracks. These offer wonderful opportunities for walking, riding, cycling and bird-watching, all directly from the door of Pepper House. 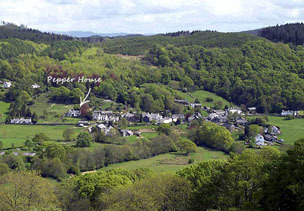 A mile north of Pepper House, on the site of the former Grizedale Hall and its buildings, is the Grizedale Forest Visitor Centre, with amenities such as bike hire, forest shop and excellent café, plus the “Go Ape” aerial adventure trail. Horse riding is catered for at Bowkerstead Farm in Satterthwaite, a short walk from Pepper House; you may also board your own horse there. 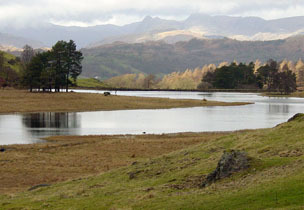 Also nearby is the Grizedale Camping Site. From many points there are superb views of the Coniston Fells, the Langdales and the South Lakes ranges. Via the forest trails there are walks to Coniston Water, Tarn Hows and Esthwaite Water; to John Ruskins’ Brantwood on Coniston’s East Shore, and Beatrix Potter’s Hill Top at Near Sawrey; to the open fells of Parkamoor and Bethecar Moor. To the south is the beautiful and largely undiscovered Rusland Valley, quiet all year and offering pleasant rambles to find treasures such as Rusland Church with the grave of Arthur Ransome, and the woods of Stony Hazel and Rusland Beeches. There are several RSPB reserves on the periphery of the Lake District, around Morecambe Bay - notably Leighton Moss. At Hawes Water you may be lucky to glimpse England's only Golden Eagle, whilst at Bassenthwaite Lake in the summer, you can watch ospreys fishing.